What is the tolerance level for collateral damage during drone strikes? It's been a topical subject for years, as the U.S. and other countries fight the war on terrorism from the air and not so much the ground. British screenwriter Guy Hibbert (Prime Suspect) wrote the script for Eye in the Sky in 2008. Years later, after controversial drone bombings like the one on an Afghan hospital in 2015, his fictional story is more relevant than ever. 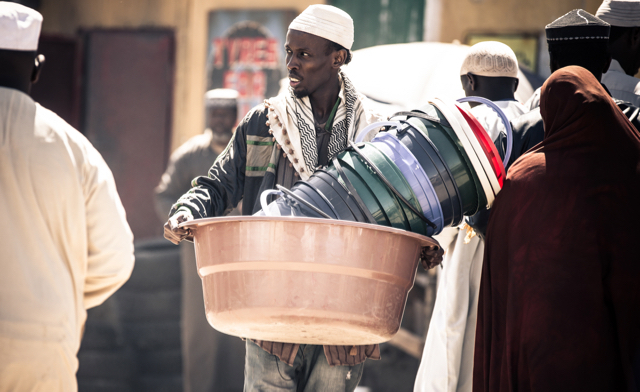 Barkhad Abdi co-stars in the thriller Eye In The Sky. Colonel Katherine Powell (Helen Mirren) has tracked a British radical (Lex King) for half a dozen years, finally cornering her in the outskirts of Nairobi, Kenya where she is setting up a suicide bombing with Al-Shabaab terrorists. Sophisticated American drone surveillance follows their every move. Powell and other officials monitor the action from a war room. Their local operative, Jama Farah (Barkhad Abdi), spies on the ground. All involved are pretty set on a targeted bombing, which will avoid mass destruction. An American drone pilot named Steve Watts (Aaron Paul) is ready to pull the trigger. Then inexplicably, a nine year-old girl sets up a bread stand right at the corner of the house that shields the terrorist. The intelligence team wrestles with the choice of obliterating the house where bombers are plotting and risking the girl's life, or letting the terrorists go and commit mayhem. Heated, desperate calls are made to the U.S. Secretary of State and British Foreign Secretary. None want to be caught dead killing a civilian. Powell and her boss Lieutenant General Frank Benson (the late Alan Rickman) are frustrated and bullish. Lower ranked personnel like Watts and a Sergeant Mushtaq Saddiq (Babou Ceesay, Half of a Yellow Sun) stymie their efforts, buying precious time. It's hard to watch the film and not vacillate between wanting them to act, and wanting them to stand down. Your emotions, opinions and speculation for the final outcome changes from scene to scene. That's the mark of a well thought out script, a strong plotline, pivotal dialogue and engaging life-like characters. Add to that mix artful, skillful guidance from the brilliant director Gavin Hood, whose first entry into the international film market was the Oscar-winning, heart-wrenching South African film Tstosi. There isn't a real weak link in this taut psychological thriller that is told in real time (102 minutes) and was shot in South Africa. The outside shots of the village are particularly believable (Haris Zambarloukos, Thor). The inside shots of the control rooms, not so much, they look like sets. The musical score, by Paul Hepker and Mark Kilian (Tsotsi), builds and ebbs at the right times. Megan Gill's (Tstosi) editing barely leaves enough down time for a clock to tick. Some might have thought that Minnesota mobile sales person turned actor Barkhad Abdi (Oscar-nominated for Captain Phillips) was a one-hit wonder. In fact he is so natural as the operative that you'd think he had a much longer resume than one film. Mirren has the right amount of bravura, outrage and diplomacy for her part, especially considering that she is stuck between four walls. Aaron Paul delivers an impressive low-key fortitude. Ditto Babou Ceesay. The supporting cast is strong throughout: Rickman, Phoebe Fox and Iain Glen. To bomb or not to bomb? It's a question that becomes a barometer for political viewpoints, military strategies, ethics and values. It's a premise that carries this film through to the inevitable. That's an ending that becomes the lesser of several evils.